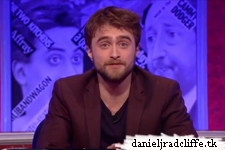 And this was the second time that Daniel appeared as the guest host of BBC One's Have I Got News for You (series 49, episode 1) which aired yesterday. Regular team captains Paul Merton and Ian Hislop were joined by panellists Diane Morgan and Armando Iannucci. You can currently watch the episode via BBC iPlayer or below. Update: 14th April 2015. You can find a clip from the extended version of the programme called Have I Got a Bit More News for you below.